Thanks again to everyone who joining us in support of the Central Texas Food Bank. You met our 3-to-1 match with such great enthusiasm that we were able to deliver over $63,000 to the Food Bank. This enables them to provide 181,000 lbs of food to children and families in Central Texas this summer, a time when families are struggling to overcome gaps in breakfast, lunch, and childcare provided by schools during the rest of the year. We’re humbled by your quick call to action and the overwhelming success of the drive. We certainly couldn’t have done it without you. 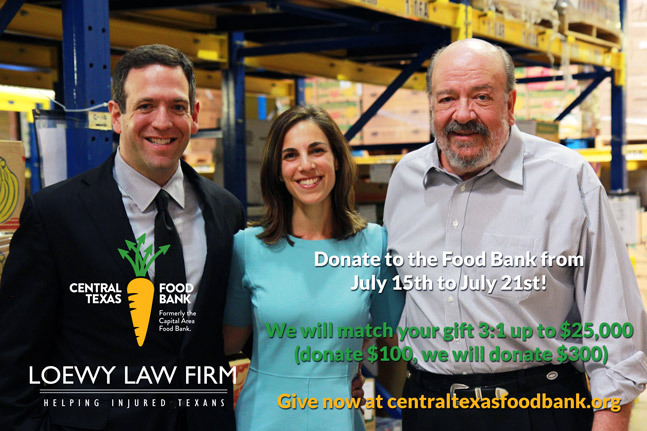 From everyone at the Central Texas Food Bank and Loewy Law Firm, thank you for helping so many families in need this summer!